DHARAMSHALA: Reiterating that Tibetans do not seek separation from China, His Holiness the Dalai Lama has expressed hope that the new Chinese leadership will use common sense and follow Deng Xiaoping’s wisdom of seeking truth from facts. Delivering a public talk on ‘The Virtue of Non-Violence’ in New York on 20 October, His Holiness said that over the last 60 years four distinct eras can be seen: Mao’s era of ideology; Deng Xiaoping’s era of creating wealth; Jiang Zemin’s welcoming the better-off into the party and Hu Jintao’s not entirely successful attempts to secure a harmonious society. Harmony is essential, but it is secured by trust and respect and not by use of force, he said. “Now a new era associated with Xi Jinping and Li Keqiang has begun, in which it may be hoped they will exercise common sense and follow Deng’s admonition to seek truth from facts,” His Holiness the Dalai Lama said. He said every week 10-20 Chinese come to Dharamsala to see him. His Holiness the Dalai Lama reiterated that overwhelming number of Tibetans do not seek independence but genuine autonomy for Tibet within the framework of the Chinese constitution. “90% of the 6 million Tibetans in Tibet feel our goal is realistic and can work. Of the 100,000 or so living in free countries, again about 90% support us. A small group think differently. One or two of them want outright independence,” he said. 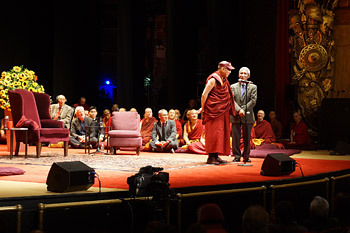 His Holiness the Dalai Lama further said that most of the world leaders that he met advised him to work things out with the Chinese through dialogue. He explained that if we continue pursuing independence, the international community, not even the UN, would support our cause. Therefore, we have proposed the Middle Way Approach to deal with the Chinese. This has helped the Chinese policy of opening up Tibet and allowing greater freedom of movements for Tibetans to visit outside and vice versa. Fact-finding missions were sent to Tibet to asses the situation, His Holiness said. “We want to modernize Tibet. But we must be able to preserve our fragile natural environment, whose waters serve a billion people in Asia, and we must be able to protect our culture, language and religion. Once again, monastic centers must be revived to be the center of learning for students from all parts of Tibet inlcuding Kham and Amdo. This is a unity we seek to restore,” His Holiness said.